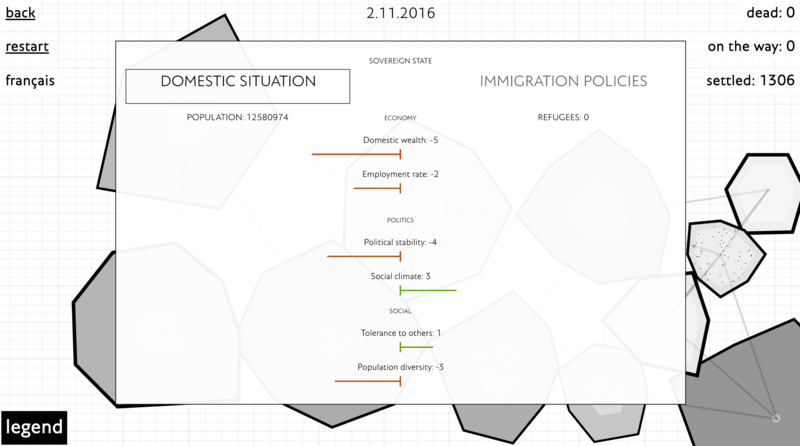 simborder is a computer simulation attempting to represent the multiple layers of interaction at the bureaucratic level when dealing with influx of refugees on several countries. the software generates a set of neighboring countries, each with their own public policies, relating directly to welcoming refugees (border control, financial subsidies and allocations, possibility to reunite families and naturalization). the user is then offered the opportunity to change these policies as she sees fit. simborder creates space for thought when it comes to deciding criteria to assess the efficiency of these policies. is it economic growth? voter approval? survival of migrants? without offering any response, simborder nonetheless looks at the complexity of the political apparel at play in these modern challenges. as a system, simborder is not objective. its behavior merely represents the point of view of its author, as all system does, be it political or computational, written by a lawmaker or a programmer.